"Aspen Green Velour 3 3/8"" x 2 5/8"" x 1 3/16"". Shown with a Die Cut Pad Printed 10KT, for a Jewelry Set. Sold by the dozen, made in USA." 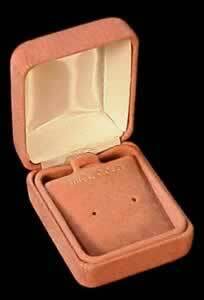 "Sahara Camel Velour 2 5/8"" x 2 3/16"" x 1 1/8"" Box. 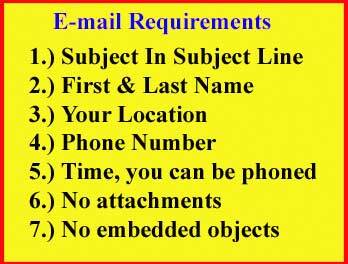 Use for pendents & other items. 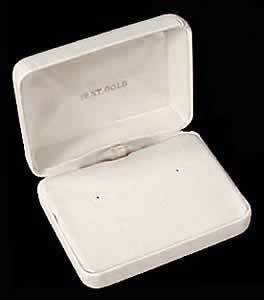 Sold by the dozen, Made in USA"
"White Coverlim Simulated Leather, 3 3/8"" x 2 5/8"" x 1 3/16"", for 18 KT Gold Earrings. Complete with a Black & White Mable Paper covered two piece outer packer. Sold by the dozen, made in the USA." 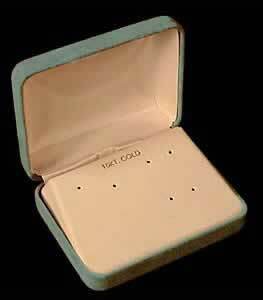 "Old Rose Velour, Mini Earring Puff Pad Box,1 11/16"" x 1 11/16"" x 1 3/16"". 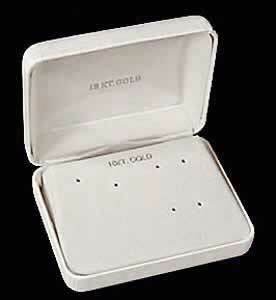 Uses a special small puff pad which is printed 14 KT Gold. 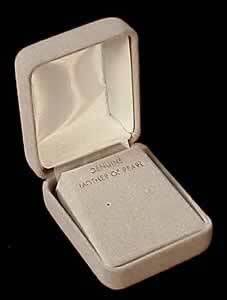 Sold by dozen, made in USA"
"White Coverlim Simulated Leather, 3 3/8"" x 2 5/8"" x 1 3/16"", Pendent Box. 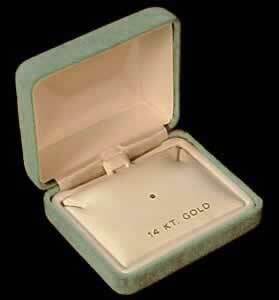 Upper Satin Puff is printed 18 KT Gold. Complete with a Black & White Mable Paper covered two piece outer packer. Sold by the dozen, made in the USA." "Grey Velour, 1 11/16"" x 2 3/16"" x 1 3/16"" Box. Chosse from our selection of Puff Pads and Die Cut Inserts. Soldd by the dozen, made in USA." 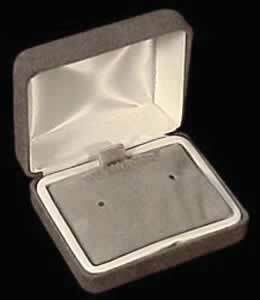 "Grey Color Velour 2 5/8"" x 2 3/16"" x 1 3/16"" Puff Pad Box.Shown with a Earring pad or chose from our selection off Puff Pads. Sold by the dozen, made in USA." 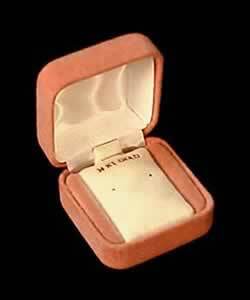 "Aspen Green Color Velour 2 5/8"" x 2 3/16"" x 1 3/16"" Puff Pad Box.Shown with a Pendent/Tie Tack pad or chose from our selection off Puff Pads. Sold by the dozen, made in USA." "White Coverlim Simulated Leather, 3 3/8"" x 2 5/8"" x 1 3/16"". Complete with a Black & White Mable Paper covered two piece outer packer. Sold by the dozen, made in the USA." 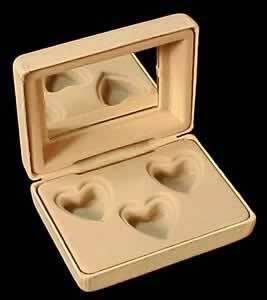 "Cream Velour.Box, holds 3 Hearts with a mirror in the lid of the box, 5/8"" x 2 5/8"" x 1 5/16"". Sold by the dozen, made in USA." 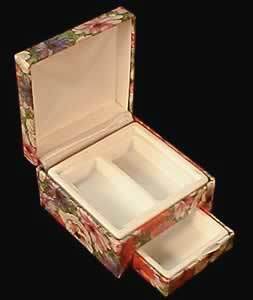 "Old Rose Color Velour 1 13/16"" x 2 3/16"" x 1 3/16"" Earring Box. Sold by the dozen, made in USA." 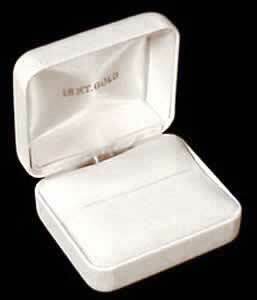 "White Coverlim Simulated Leather, Double or Large Ring Box, for 18 KT Gold Rings. 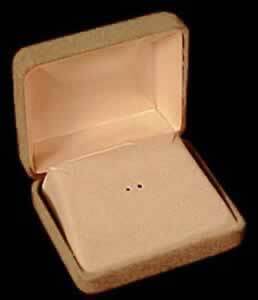 Box size 2 2/4"" x 2 1/8"" x 1 2/4"", sold by the dozen, made in USA." "Beautiful Flower Print Material, 3"" x 3 1/8"" x 1 15/16"". Has two compartments and a pull out drawer sold individually." 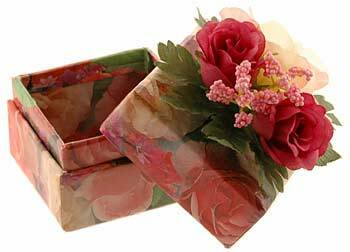 Beautiful Flower Print Material, 2 3/8"W x 2 3/8"L x 2"H; with flowers on top of boxes.